Happy Monday! I actually got around to scraping some Easter Photos of this year already! It is a record. I'm usually a year behind lol! 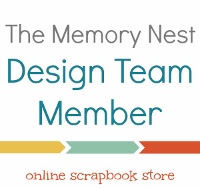 Anyways, I hope you enjoy this page I made for the Memory Nest. This is the first year in Seattle (for the six years I've lived here) where it has rained. My kids still had a blast in the down poor finding eggs. It really was just about the worst weather we possible could have here. I think in the county below us they might have even had a tornado! The Puget sound averages one tornado a year and it only lasts for a second or two and does practically no damage. We rarely even get any thunder storms. I hope you like my take on the sketch. The strip down really spoke to me for turning it into rain. I decided to sew some ombre rain drops. Then I thought clouds would work well for the horizontal stripes in the sketch. I was surprised just how many cloud embellishments I have. In the end, I went with these dark blue transparent clouds. I almost went with some yellow ones, but decided that they blended with the background too much. Sorry my photo is a bit washed out. My camera hates white backgrounds when I take them at night and I can only edit so much. My little helpers make it difficult to take the photos during the day. Love the stitching! What a sweet page! Such a fabulous and fun page! Love everything about it! !